Back to the Bible is a worldwide Christian ministry dedicated to leading people into a dynamic relationship with Jesus Christ. 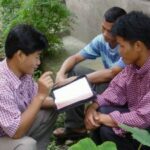 Committed to world evangelism and discipleship, Global Missions sends missionaries, resources global ministry, and networks through interdependent partnerships with the Church around the world. Operation Compassion responds to natural disasters throughout the U.S. and beyond.